Without a doubt, this is probably the most stomach-churning, disturbing, and yet totally fascinating story I've read in a while. Even more so because each tough scene was spoken by the very creepy and capable Corey Brill, who was a new-to-me narrator. Scoutmaster Tim takes five boys every year to a Canadian island to practice survival and wilderness skills, and each time Max, Newt, Shelley, Ephraim and Kent continue their friendship and build memories to last a lifetime. They didn't realize that on this very boat ride to the island, it would be the last one they would all take. Someone, or maybe something, else will be on the island that will change all of their lives. 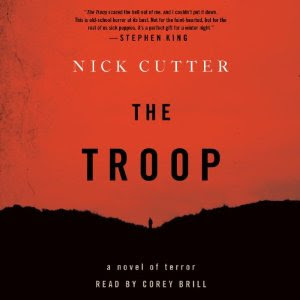 Told in alternating time periods when the boys first arrived on the island with interviews and articles taken and written after the events on Falstaff Island, The Troop is a horror-filled tale of total and systemic destruction of life, sanity and friendships. When a skinny yet terrifyingly hungry man arrives on the secluded island, Scoutmaster Tim does his best to help the stranger, using his medical skills to treat his unusual patient. He doesn't realize that he's unleashed a disease, a contagious sickness so debilitating that it quickly reduces a person to one very simple, primal urge. Unbeknownst to them, this quiet and thin newcomer carried a man-made weapon that could destroy them all. This was my first time listening to Corey Brill and it won't be my last. While it took me about twenty minutes or so to get used to the staccato like rhythm of his cadenced narration in some parts, I got used to it and thoroughly enjoyed the story told in his voice. I'll likely pick up The Deep in audio soon to carry on with the horror. FTC Disclosure: I purchased this audiobook through my Audible.com membership. Click here to listen to the sample. Nick Cutter is the pseudonym of an acclaimed Canadian novelist who has been compared to Stephen King and Chuck Palahniuk. I read the book in print and all I can say is that it should come with a warning NOT to eat spaghetti while reading it. Wow, I don't think I could handle this on audio! I don't think I could handle it ... period. In any form ... I'm such a weenie! I put this one on my wishlist after Ti reviewed it. I'm wondering if I can stomach the audio --easlier to gloss over the gore in print:) Great review Natalie. LOVED this book. I read it in print and just adored it. Pure, old-school, gory terror. I never thought about listening to it on audio. Now, you have piqued my interest. I will definitely give that version a go when I am in the mood to re-read it. That does sound like a psychological chiller. Great review. Geez, not on audio! I could barely stomach Lord of the Flies. I read Battle Royale, which is super gory, but it's not psychologically and emotionally terrifying like Lord of the Flies is and what The Troop seems to be. Yikes!